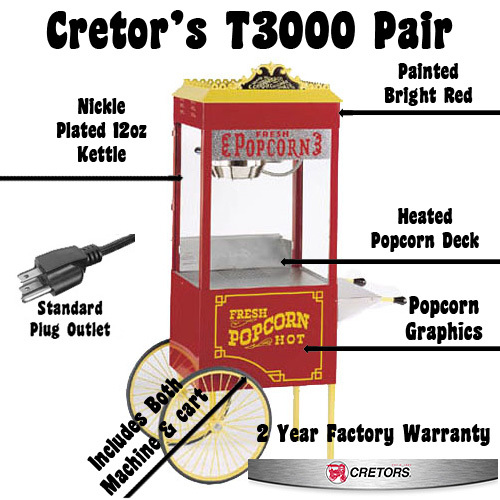 Cretor's T3000 Antique popcorn machine offers one of the highest output 12oz popcorn machines on the market while still using a standard plug. The T3000 Antique popcorn popper plugs into a standard 110V wall outlet . 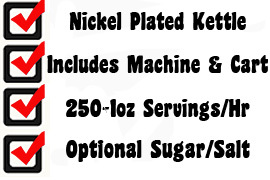 The T3000 antique popcorn machine offers an optional sugar/salt switch for kettle corn. Cretor's T3000 Antique pair is on hot popcorn machine. Features: 240 one ounce servings per hour. The T-3000 is available in an antique version with a hand painted scroll. The stainless steel frame is painted with Cretors special powder coating that resists scratching. A matching two-wheel red cart is also available. Designed for use with 12 oz. portion packs. Can be purchased without matching cart.Online purchases may inquire addtional cost depending on ship location. Must be shipped by truck. Call for ship quote.